"It’s been decided. 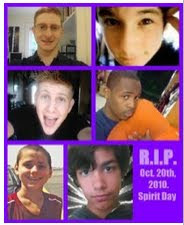 On October 20th, 2010, we will wear purple in memory of the recent gay suicides. Many of them suffered from homophobic abuse in their schools or in their homes. We want to take a stand to say that we will not tolerate this. Purple represents Spirit on the LGBTQ flag and that’s exactly what we’d like all of you to have with you: spirit. Please know that times will get better and that you will meet people who will love you and respect you for who you are, no matter your sexuality. Please wear purple on October 20th to remember all the lives of LGBTQ youth that have been lost due to homophobia. Tell your friends, family, co-workers, neighbors and schools." Thanks, Brittany. It's a great idea. We all have two more days to get the word out, and get ourselves a purple shirt. You can spread the word on facebook here or here or here. And on Wednesday, wear purple with me. my s chool is doing this...next week. breast cancer awarnbess has pink tomorrow @ school. althouigh im pretty sure everyone who isnt living under a rock knows babout breast cancer.